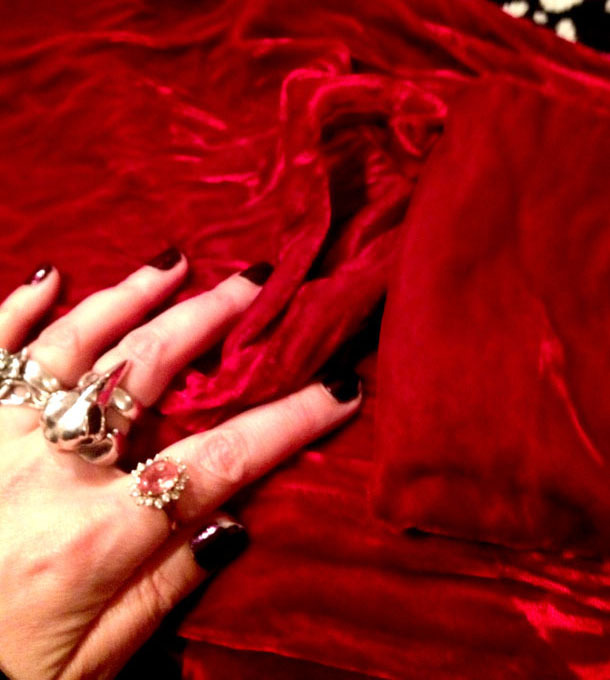 Velvet is a wardrobe basic for Goths and other creatures of the night. But velvet can be a high-maintenence fabric: if it’s not some sort of cotton velveteen or Lycra-enhanced stretch velvet, the lush pile of the fabric can end up damaged. “Pile of the fabric?” That’s the thing that makes velvet, well, velvet: a raised nap of thousands of threads, which is why velvet has a different texture depending on which direction you run your hand across it. The fabric is woven on a special loom that weaves two thicknesses of velvet at the same time. After weaving, those two pieces are cut apart to become separate lengths of fabric, each with a pile. Which is why velvet is so luxurious to the touch, but is also why it can be difficult to deal with. 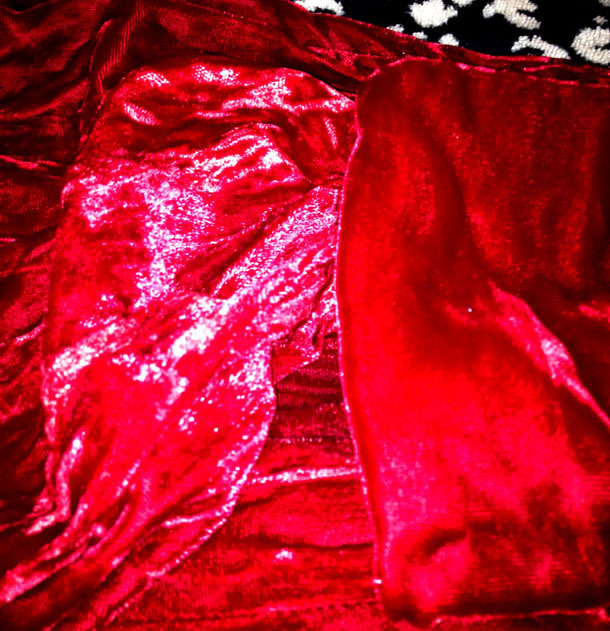 The pile of the velvet can be changed by water, such as rain spots on velvet coats, a perennial Goth problem, or even just by everyday life, such as how the friction of sitting can flatten out the texture of a velvet skirt in very specific locations. There are special tools and techniques for refreshing and refluffing flattened or crushed areas of velvet, but in the Lady of the Manners’ opinion, once velvet has been crushed, it can never be restored to its former lustrous perfection. But wait! Don’t despair over your rain-spattered, smushed velvet garments! Because there is a way to give them new life and a new texture. That’s right, Snarklings, it’s tutorial time! The velvet garment in question (this project works best on velvet that is polyester, rayon, silk, or a mixture of those fibers). A spray bottle full of clean water. A flat surface you can lay the garment out on. Ironing board, table, kitchen counter, whatever heat-resistant surface is handy. Make sure it’s at a height you can comfortably sit or stand at! Additional, but not necessary, supplies include a playlist of music you like, or a favorite movie or TV show to have on in the background, and a tasty beverage of your choice. Step 1. (After you’ve started your background entertainment.) Plug in the iron, and set it to a medium-high dry heat setting. Step 2. Lay the towel out over the flat surface you’re using, then lay your velvet (pile side up!) out on top of the towel. Step 3. Grasp a section of the velvet and scrunch it up. The Lady of the Manners usually goes for haphazardly gathering a section into pleats. Step 4. Mist the scrunched, pleated section of velvet with water from the spray bottle. You’re not trying to drench the fabric, just make it damp. Step 6. Lift the iron and let go of the velvet. The pile of the velvet has now been crushed in various directions, giving it a multi-textured effect! Step 7. 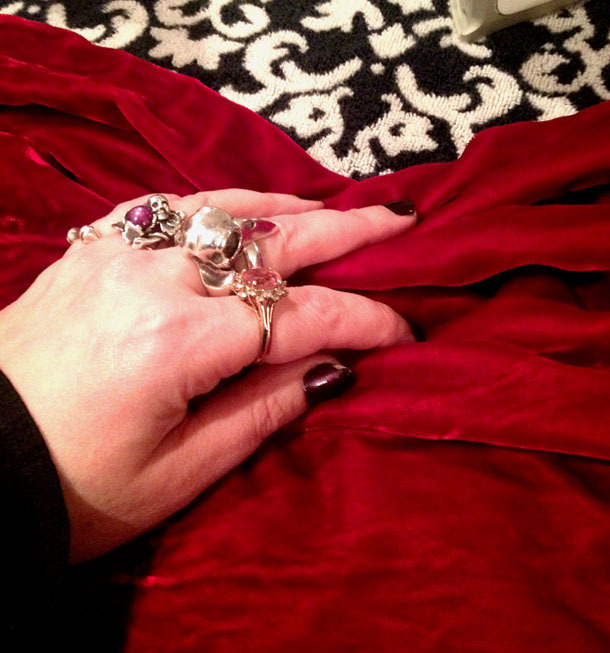 Repeat, repeat, repeat, until you have crushed ALL the velvet! Sometimes you will need to go over scrunched and pleated sections multiple times, but eventually you will have permanently altered the pile of the velvet, and you will have a garment that looks dramatically different than what you started out with! 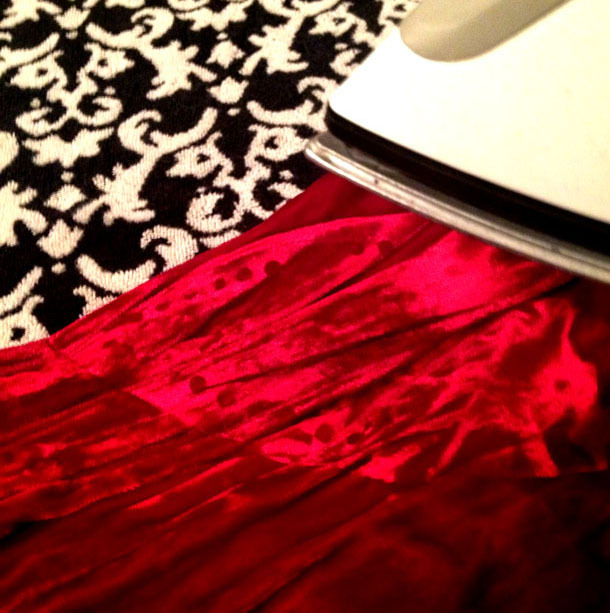 Be warned: once you get the hang of this, turning velvet into crushed velvet can be strangely soothing and addictive. By the time you read this tutorial, the Lady of the Manners will have done this to two skirts and two blazers that have been lurking around in the Storage Heap Room o’ Doom, and is eyeing some other velvety things she has lying about. Because it’s so much fun! Might we see before/after to compare results? 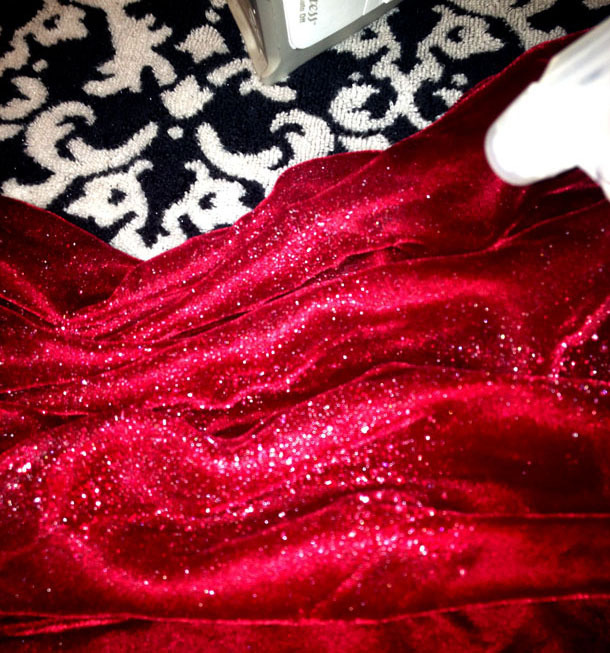 If you have a rubber stamp or something similarly heatproof you can crush patterns into your velvet. Put the stamp design side up on your pressing surface and put the velvet napped side down onto the stamp and press as hard as you can with your steamy iron. It takes a bit of practice but the effect is very pretty. You can use a white vinegar-and-water solution to both remove creases and to set pleats with your iron, [Let pleats cool/dry completely before moving to the next section.] but I haven’t tried it on velvet. Wow, that is interesting and a good maintenance tip for us in a subculture that loves velvet. I remember seeing the first picture and starting dreadfully. I should be used to this by now but the kitten in your picture looks just like my youngest kitty, Isis, even the looking up is something she always does. I’ve wanted to own a wardrobe filled with lace, silk and velvet finery for a long time but not only do I not have the budget for that nor the accessibility to the clothing for it either after hearing the horror stories of velvet forever lost from rain or everyday wear and tear I was much better not having it. Though I do own a pair of lace gloves and a silk tie which I absolutely adore. I am wondering, what does the velvet feel like after you’ve done this? Thank you so much! I have a velvet coat that needs a bit of love. I may turn it into crushed velvet instead of trying to restore it. That’s amazing! Also, great choice of entertainment. I love anything by Vincent Price. And yes, he’s the reason I go by Vincent (I had to come up with a new name for… Gender stuff…) Anyway… The entire tutorial is fantastic! Quick tip – this can save velvet the clothes moths have munched indentations into. Used the crushing technique on a sadly motheaten but beautiful long coat and the small holes and bare spots are now completely hidden! Thanks so much for this post.